For PC independent temperature documentation. As the individual illustrations show, the disc-type pen-recording thermometer is installed permanently in the refrigerator or freezer. It has a battery-operated quartz mechanism (independent of mains supply). the exchangeable recording disc are sufficient for a 7-day period. The temperature is recorded on the disc with a blue felt pen. The temperature sensor of the disc-type pen-recording thermometer is located in a refrigerant flask inside the refrigerator or freezer, so that the temperature of the appliance’s contents is measured rather than the air temperature. 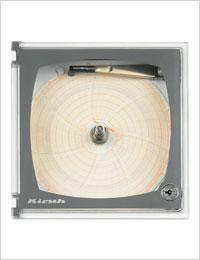 The front window of the disc-type pen-recording thermometer can be locked.